Everybody tells you about how hard being a mom will be, but they always make it seem like it’s the parenting that’s the problem. It’s not the baby — it’s everything else. It’s figuring out how to be a human again, when all you want to do is watch your 15 week old try to grab something for 2 hours. Then during nap time, feverishly figuring out how to do all of the mounds of laundry that somehow an infant creates, pay the bills, feed the dog, call the AC people, then abruptly stop everything to go feed the crying child with your body, then repeat. All day. Then, finally, he’ll be asleep for the night and you’ll have the time to work on your stuff. Or work out. Or hang out with your husband. Or eat something that’s not a PB&J for the first time that day. But…. you won’t. Because, you’ll be so braindead that the most energy you can muster will be to drink half a glass of wine while watching a show that you used to think was stupid, before passing out without brushing your teeth. Otherwise, life is good! The part I enjoy is hanging out with the baby and I get to do that for most of the day! He’s adorable and amazing and there has never been another one like him since the dawning of man. Those are facts. And every day I get to wake up to his beautiful toothless grin! His latest hobbies are chewing on his hands, assisted squatting, and spit-bubbles. He also loves this piano thing that my parents got him, so, every once in a while, we’ll have a “jam session.” It’s mostly just a session. Anyway, starting now, I’m going to try to be a real, live human in the world. 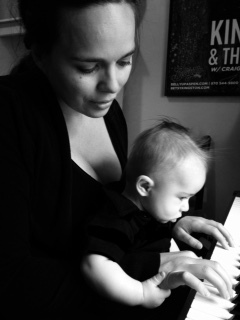 My self-designated maternity leave has come to an end and I’m ready to get my head back in the game of music. My husband has enabled me to take this path through his own career choice to work at home to help share the (lovable) load, so, all jokes aside, he’s pretty much Husband of the Year. The writing is about to get serious, y’all! By the way…. THANK YOU*** for all of the listens and purchases of “Barefoot & Pregnant” over the past few months!!! Makes me tear up just thinking about it! *I say things like “go jump in a lake” now that I’m a mom. **If you guessed “baby,” you are correct! You win nothing, but the valuable lesson above. Congratulations. ***:::PLUG::: For those of y’all who haven’t had a chance to hear “Barefoot & Pregnant” the EP… it’s still up for grabs on Amazon, iTunes, Spotify, and just about any other digital vendor you can think of! © 2019 Betsy Kingston & the Crowns. All Rights Reserved.